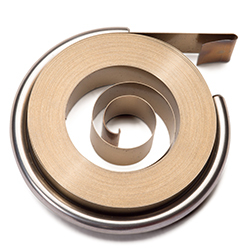 Our SPIR'ATOR prestressed power springs are produced by reverse winding a NEG'ATOR spring on an arbor and enclosing it in a case or retaining ring. Rotational energy can be obtained from either the arbor or case or, when linear motion is required, through use of a pulley and cable attachment. With torque and deflection being equal, a SPIR'ATOR generally requires 20% less space than a conventional power spring, and also yields a flatter torque gradient. Power springs are ideal for use in applications requiring counterbalancing, winding and retrieving. Prestressed power springs from Hunter Spring are made from 301 High Yield Stainless Steel. Other materials including Elgiloy, Inconel, or high-carbon steel can be used upon request for custom applications. Hunter spring does not stock prestressed power springs. Springs are designed for customer specific applications only. Use the design worksheet to specify your requirements and allow our Application Engineers to provide you with a design to meet your needs.